Last weekend was a bit insane. I had routine appointments with my doctor and my dental hygienist Friday, and a trip to Albuquerque with Nathan on Saturday that had enough other things going on that I had no opportunity to hike while there. I had to settle for a brief hike along the Powerline Point Trail just south of White Rock on Friday afternoon, with not enough time to get to the lookout at the end of the trail. 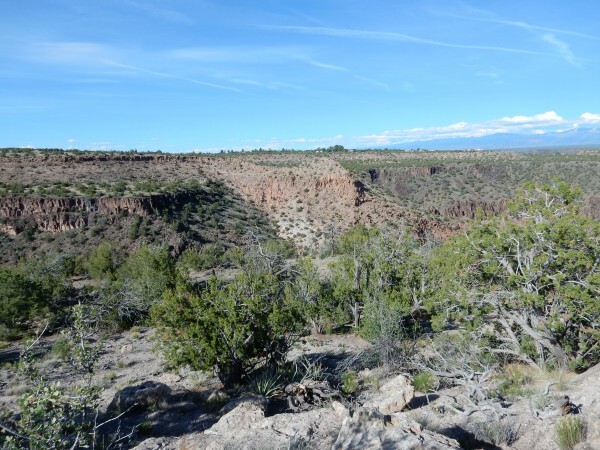 I’ll doubtless be back at some point; the lookout looks interesting and there is a side trail from there down to the Rio Grande near the mouth of Ancho Canyon. 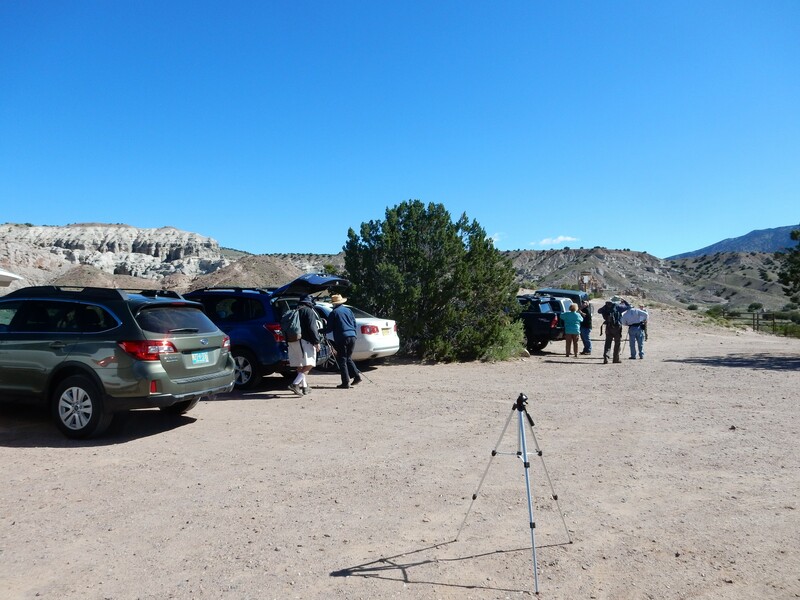 Before heading down the trail, I drove to the lookout in Ancho Canyon for a panorama. Most of the mesa north of the canyon is underlain by Tsherige Member, Bandelier Formation, Tewa Group. 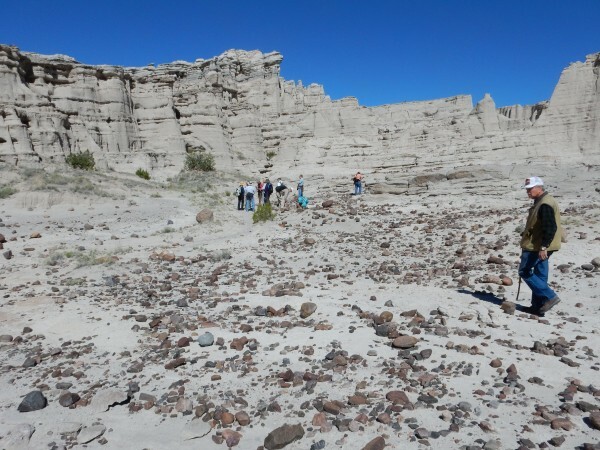 The Tewa Group includes all the rocks erupted in association with the Valles and Toledo events, 1.22 and 1.61 million years ago, and related precursor and postcaldera eruptions. All these rocks formed from magma very high in silica, which is extremely viscous and produces highly explosive and violent eruptions. 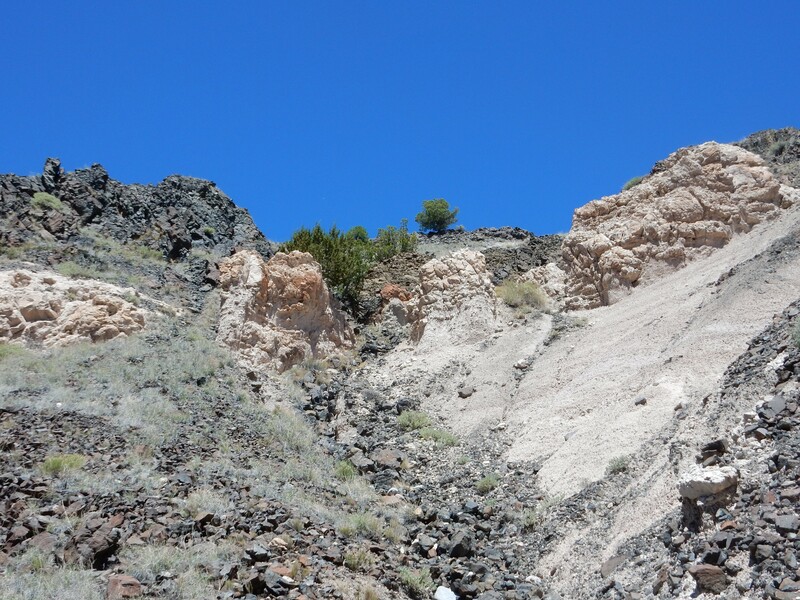 The Bandelier Formation is composed of air-fall pumice and ignimbrites from the caldera eruptions themselves, while the Tsherige Member is specifically the air-fall pumice and ignimbrites of the Valles event. Air-fall pumice is pumice, volcanic rock full of gas bubbles, lofted high into the atmosphere early in the eruption that settled to the ground in a broad area downwind of the eruption. 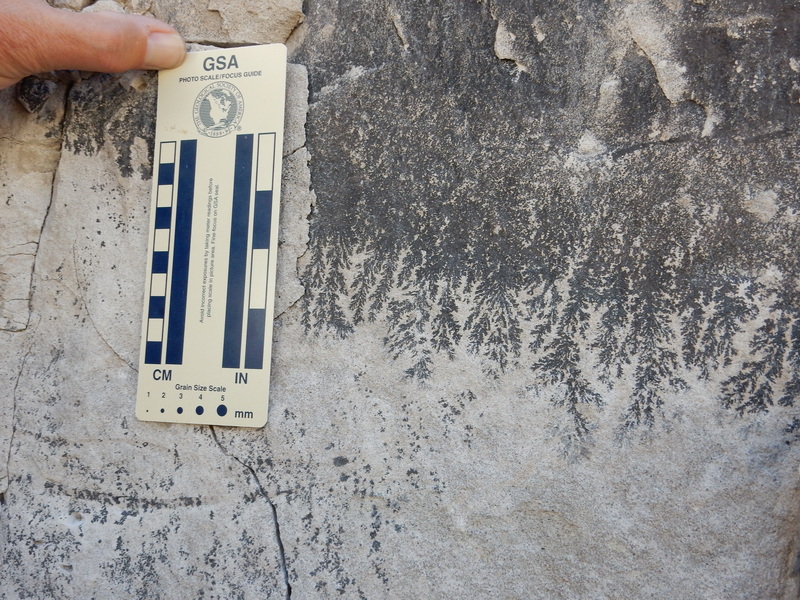 Ignimbrite is rock formed when the ash from the eruption becomes so voluminous that it no longer can be buoyed up by the atmosphere, and so flows out as a fluid mixture of red-hot gas and ash that remains at ground level. This red-hot mixture can travel great distances, destroying everything in its path, before cooling enough to settle onto the surface to form an ignimbrite, or tuff. I’ve been trying to understand the details of the Tsherige Member, which is one of the most thoroughly-studied ignimbrites in the world. There were apparently at least six separate eruption pulses, closely spaced in time, and possibly more that are hard to distinguish in the rock record. 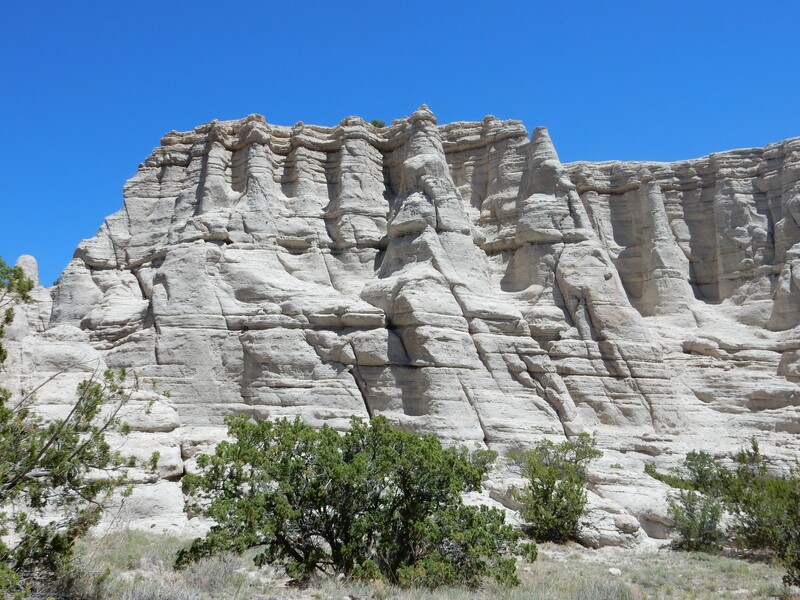 In this photograph, if I’ve understood the nomenclature, the A unit extends from the canyon floor to the prominent ledge; then follows the B unit, mostly whiter and softer tuff, and then C unit on the canyon rim. Either this unit consists of two thin layers here, or there is some D unit present at the very top as well. The A to F units (E and F appear closer to the Jemez Mountains) are from one of two competing classification schemes. The other has a Qbt 1g unit corresponding roughly to A, a Qbt 1v unit corresponding to B, a Qbt 2 unit corresponding to C, a Qbt 3 unit corresponding to D and the lower part of E, and so on. 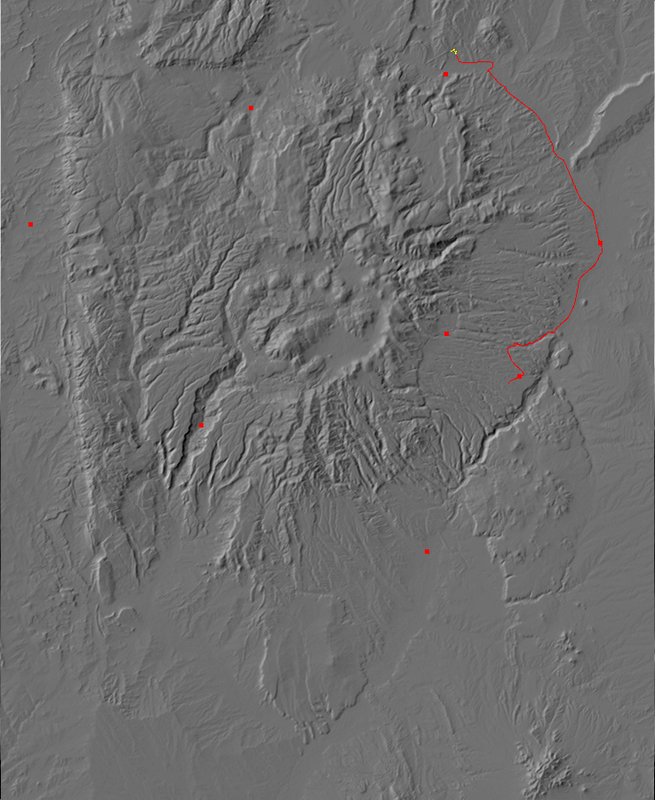 The first system emphasizes obvious differences in the character of the tuff that can be mapped over long distances; the other is an attempt to identify actual pulses in the eruption. Thus A and B show microscopic but distinct differences in the rock that may have come about after the rock was emplaced, so that they are part of a single eruptive pulse. Geologists seem to love to argue about these things, the way that Beatles fans argue about which was their greatest album. 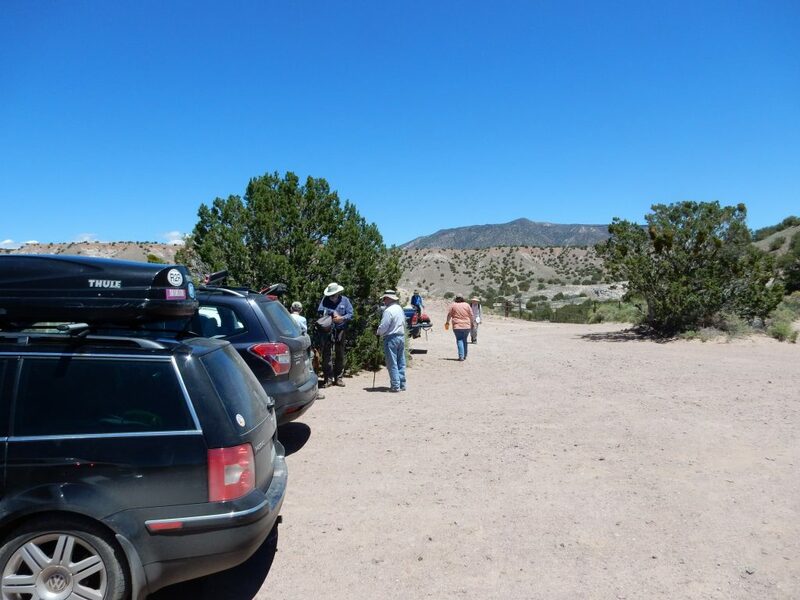 I then drove to the trail head for the Powerline Point trail and headed out. There was not too much to see until I came to an overlook into Water Canyon, to the north. 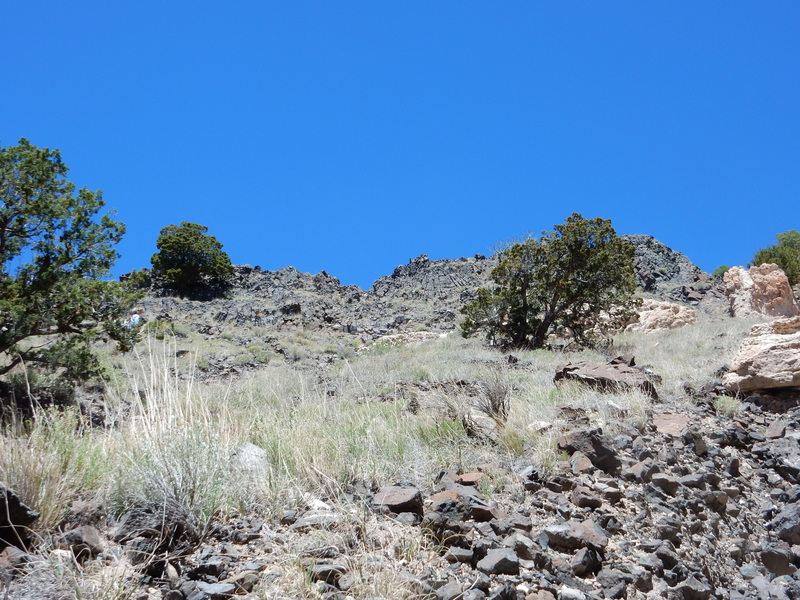 I had a tantalizing glimpse here of Bandelier Tuff filling paleocanyons in the surface of the Cerros del Rio basalt. I didn’t know if I’d get a better view further along the trail, so I took the shot. Turns out I did, so this one is not for the book. And I’ll explain more about what I’m talking about when I get to that point. 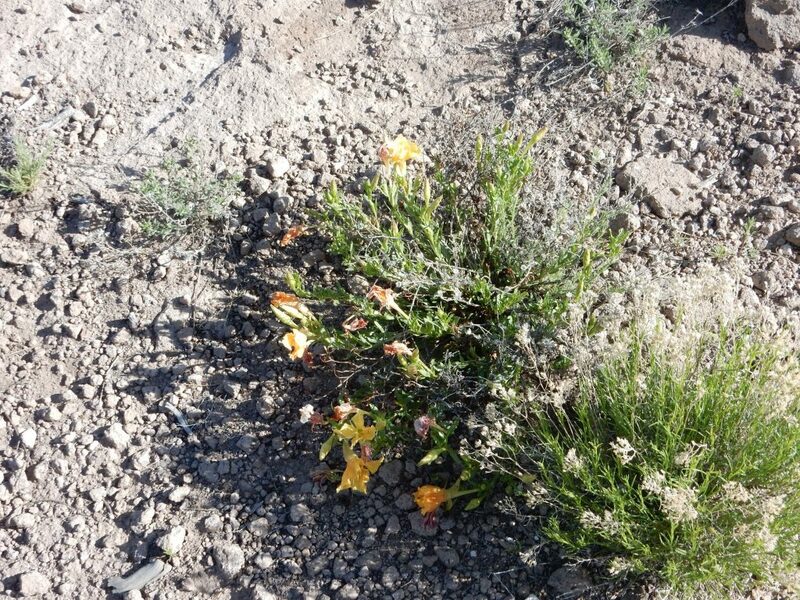 Oenothera Hartwegii, Hartweg’s Sundrops, I think. Part of the desert poppy clan. Spanish bayonet yucca blooming. 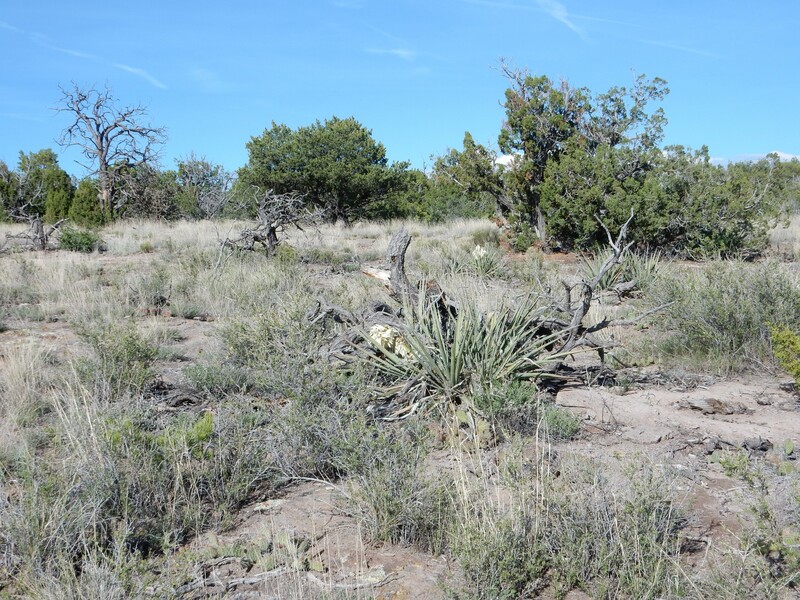 There are still some standing dead pinon trees from the bark beetle infestation of a couple of decades back. This rise northwest of the trail caught my eye, because of its thin bedding, quite unlike the lower units of the Tsherige Member. As I said, I’m still learning to identify the various Tsherige Member units in the field, but I believe the mesa top I’m walking on is Unit C, and this rise would be a remnant of Unit D. It fits the description as a gray nonwelded tuff. A closer look showed that it also turns out to be full of lithic clasts. Lithic clasts: Broken fragments of rock, either loose or cemented into a bed of softer rock. 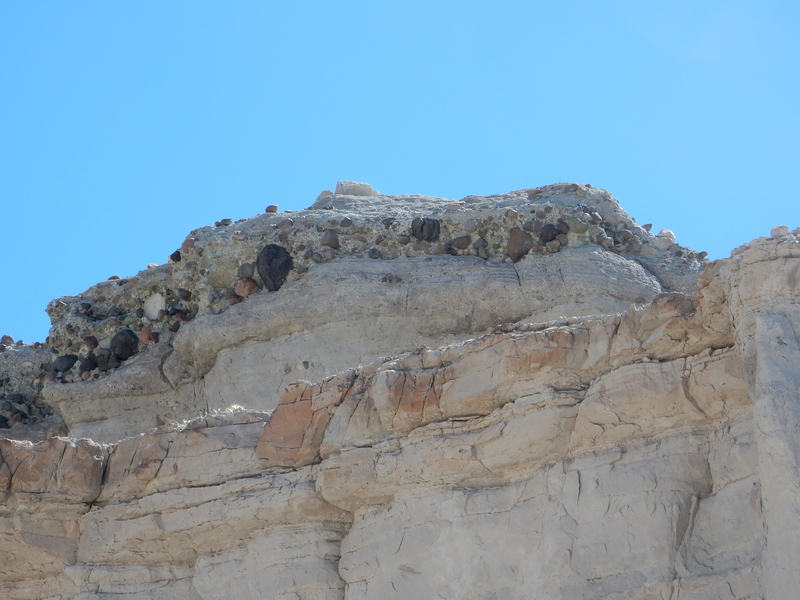 Here the clasts are made of precaldera rock caught up in the Valles eruption and cemented into the tuff. A number of clasts have been eroded back out of the soft tuff. 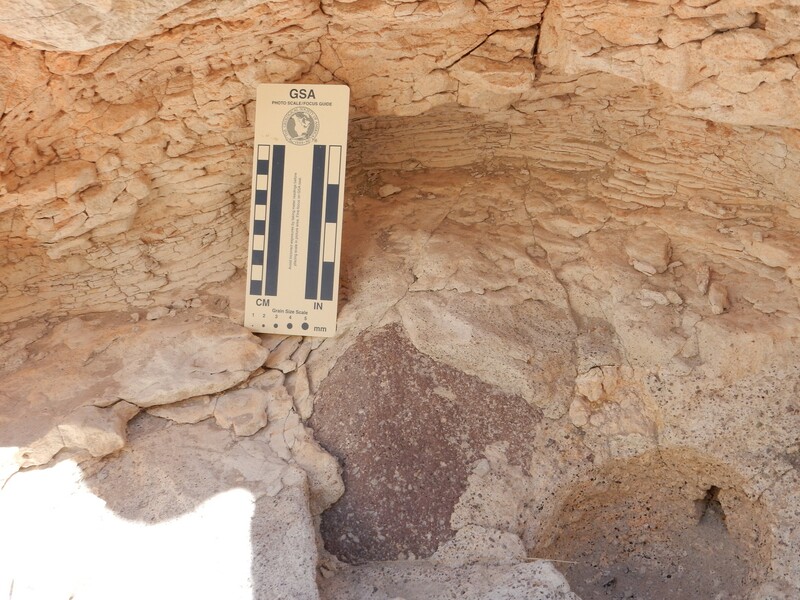 These lithic-rich beds of the D unit are sometimes interpreted as a product of the eruption pulse in which the magma chamber actually collapsed to produce the caldera. From this knoll, I had a nice view across Water Canyon. This is one for the book. You can see very clearly that a big exposure of light pink Tsherige Member fills a paleocanyon in the dark Cerros del Rio basalt. 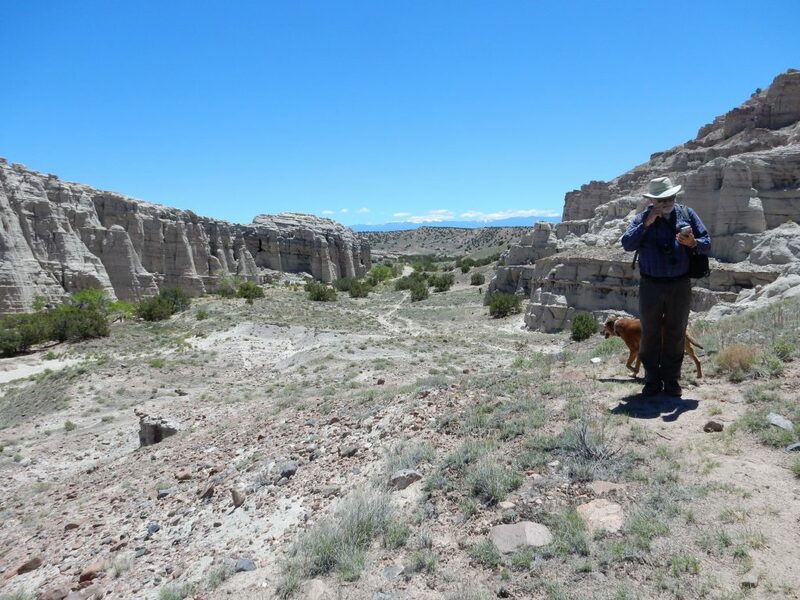 This is interpreted as a sharp westward meander of the ancestral Rio Grande, 1.2 million years ago, that also left a similar exposure on the south side of the modern Water Canyon. 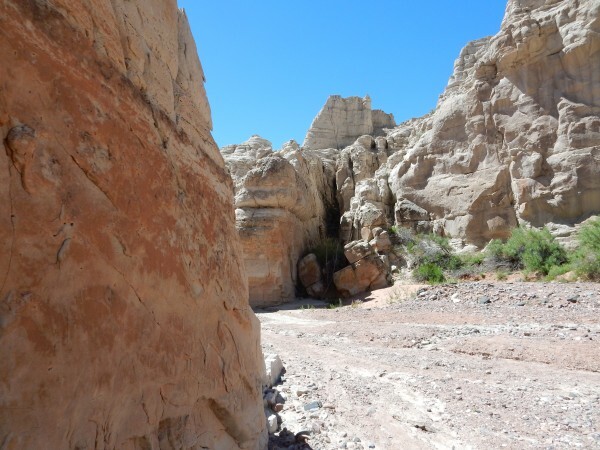 The ancestral White Rock Canyon was considerably shallower and narrower than the present canyon, and was completely choked by this flow of the Tsherige Member, forcing the Rio Grande to the east at the present canyon location. This likely produced a large lake upstream of White Rock Canyon, until the river cut back down to its present level and drained the lake. I was out of time and headed back before I could reach the end of the trail. 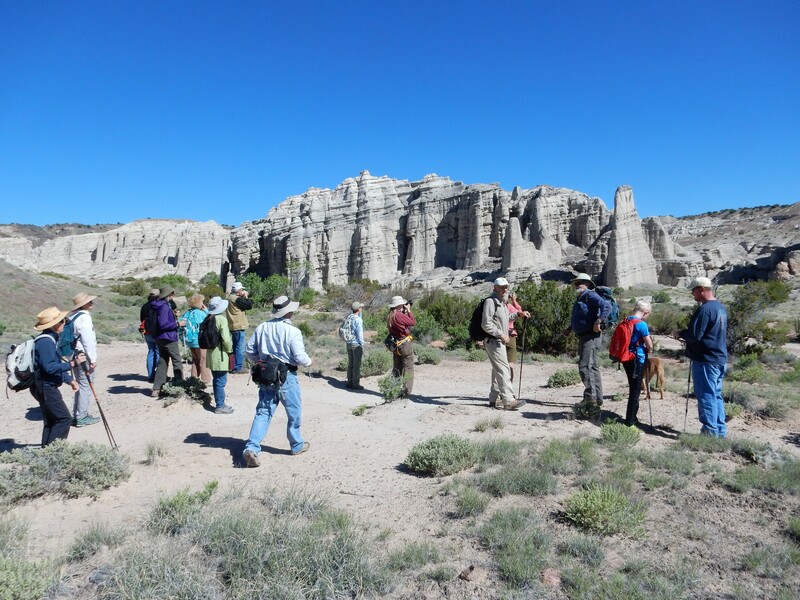 This weekend was a longer hike with members of the Los Alamos Geological Society. 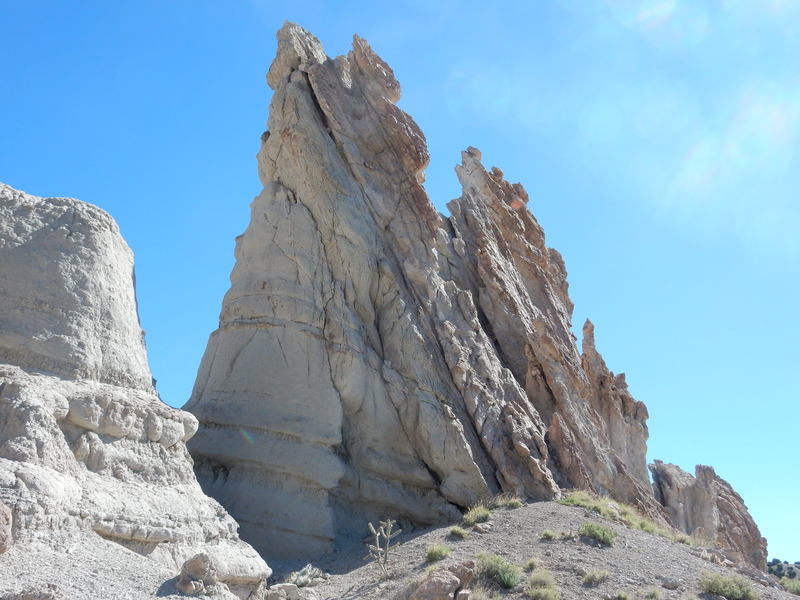 Our destination was Plaza Blanca, located just north of Abiquiu, which has spectacular exposures of the Abiquiu Formation. The group met at Sullivan Field at 8:00; I was a couple of minutes late and attached myself to the convoy pulling out of the parking lot. 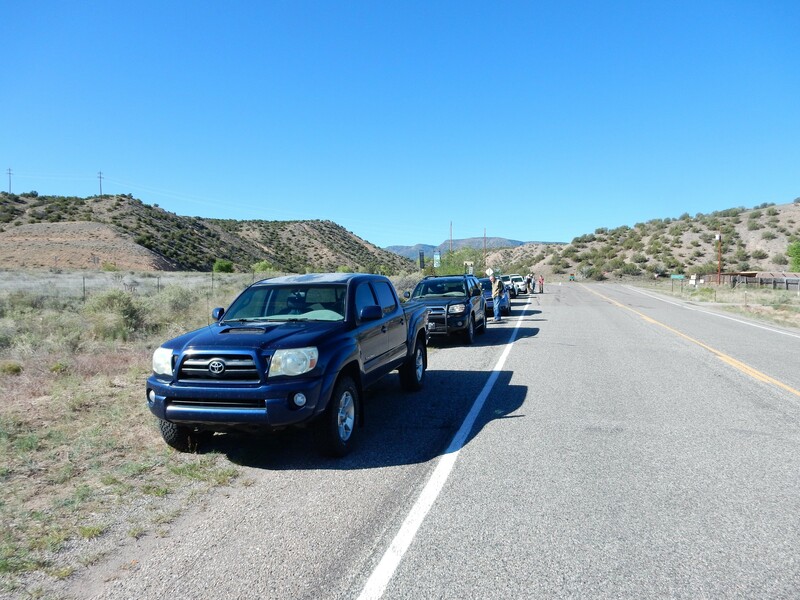 We paused again just east of Abiquiu on the turnoff from U.S. 84 towards El Rito for participants from Santa Fe and Espanola to join us. From there we headed along State Road 554 and turned on County Road 155, which takes one north of the Rio Chama. There is another turn north at the road to the Dar al Islam Mosque, which owns the land around Plaza Blanca but welcomes visitors. We congregated at the parking area. That’s my camera tripod. On the one hand, it’s wonderfully light, and thus very suitable for taking on hikes. On the other hand, it’s terribly light, so it vibrates badly in a brisk wind. 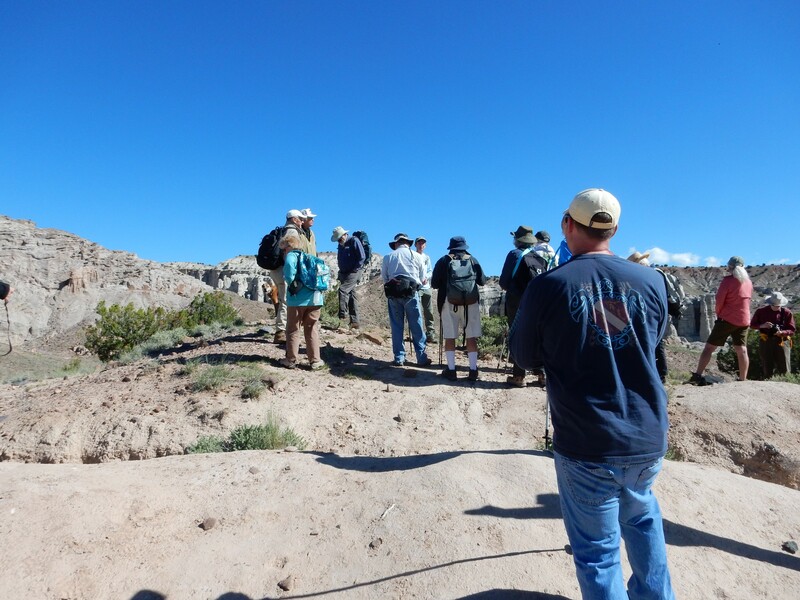 Shari Kelley gave us a brief introduction to the geology of the area. 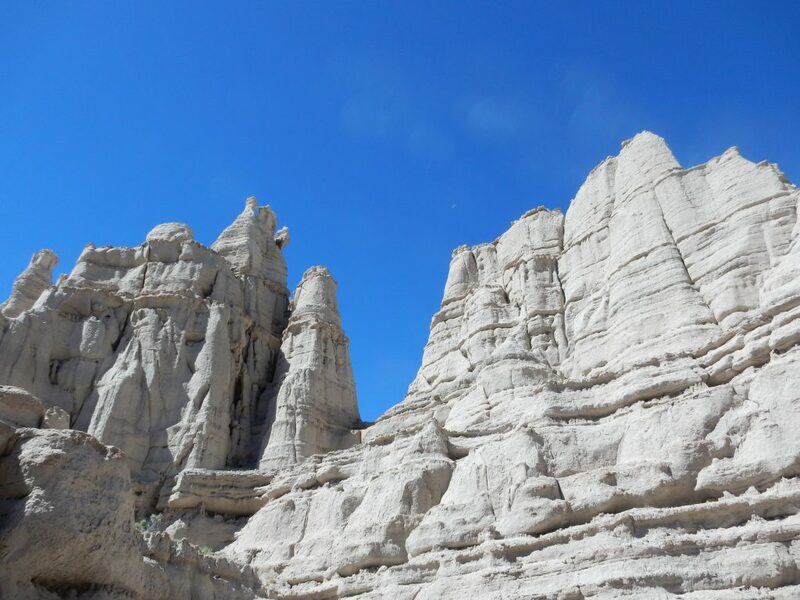 Plaza Blanca is dominated by the Abiquiu Formation, which is a sedimentary formation rich in volcanic ash from the Latir volcanic field near Taos. The beds are between about 25 and 20 million years old and are some of the first rift-fill sedimentary beds of the Rio Grande Rift, the great fissure in the Earth’s crust from central Colorado to El Paso that is followed by the Rio Grande River. 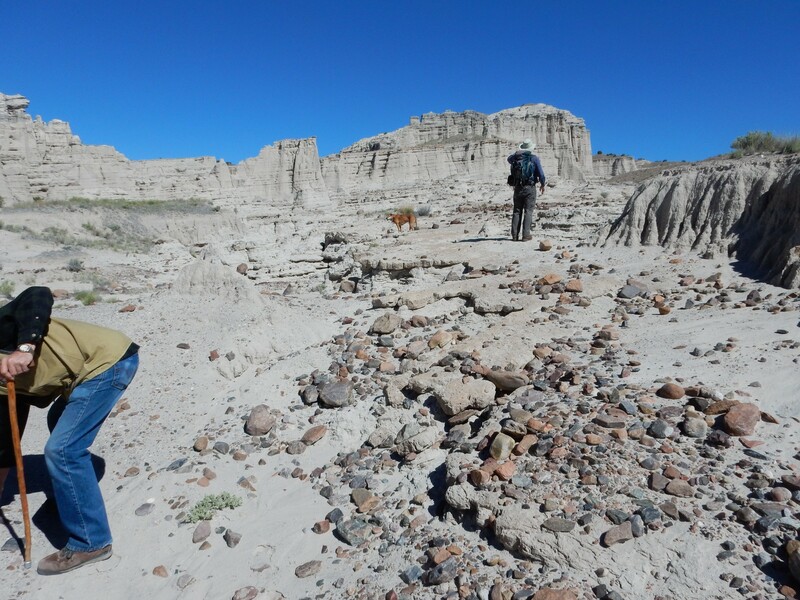 The early rift formed a low valley ideal for accumulating sediments from the Latir field. 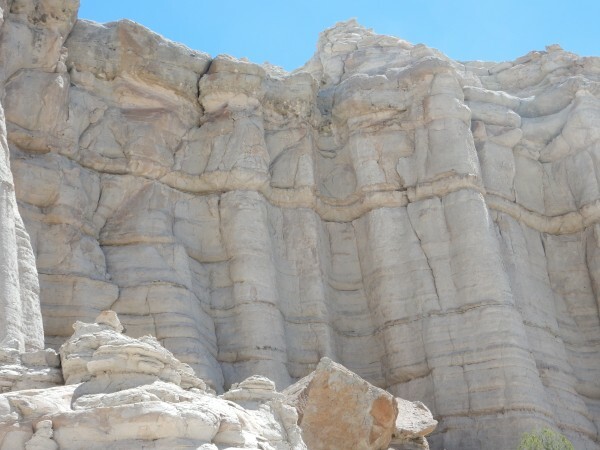 The columns here are aligned along a fault that provided mineral-rich fluids to cement the sediments together more tightly than elsewhere in the area. 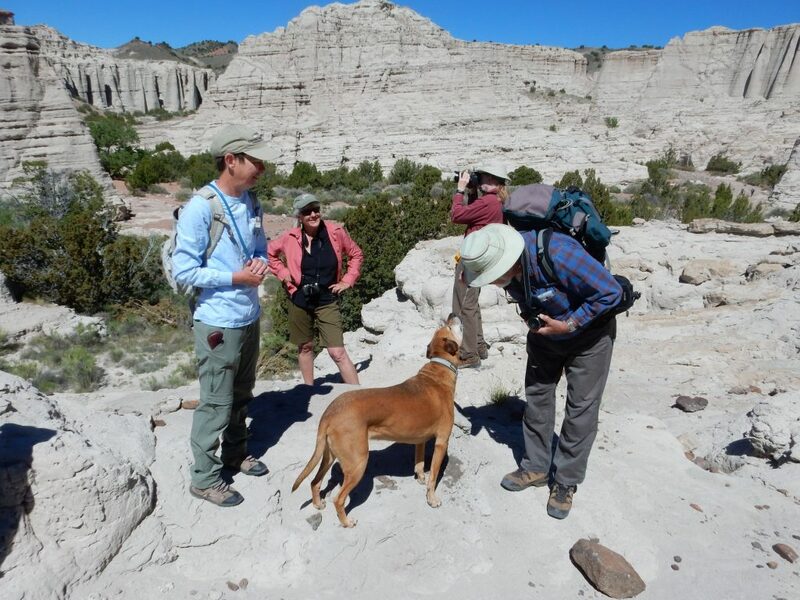 Shari Kelley tells us this is a favorite place to take geology students. 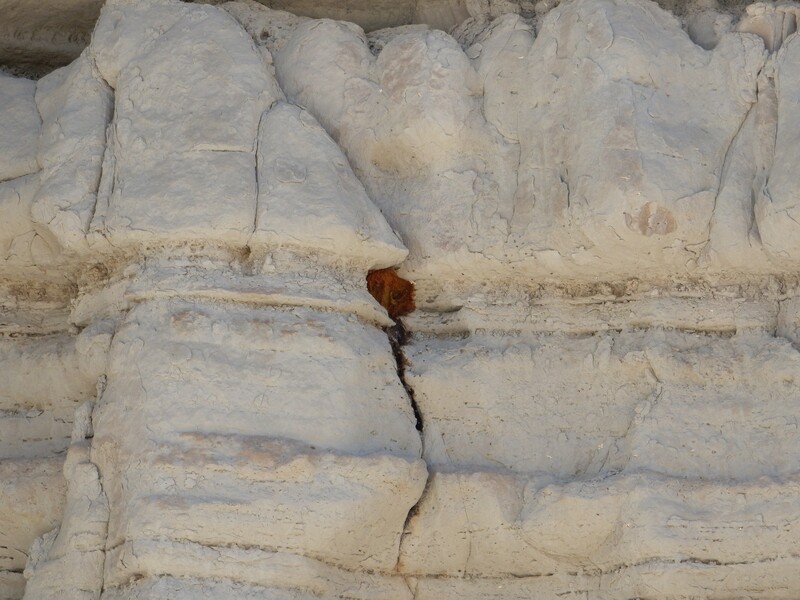 Here erosion has exposed the fault plane, where motion along the fault has polished the rock and left striations that show the direction of motion. You can see that the motion has been almost entirely vertical. This is the most common kind of fault motion. A dramatic exposure of the fault plane. The rock on either side of the fault has been cemented by minerals in groundwater brought in by the fault, and so erode more slowly than the rock further away. A striking feature of this area is lag gravels. There is very coarse gravel scattered across the area, without much fine gravel or sand. This is typical of a lag deposit, where fluid flow (in this case, likely, periodic flash floods) picks up the smaller detritus but leaves the heaviest stuff. The examples in this area are particularly good. 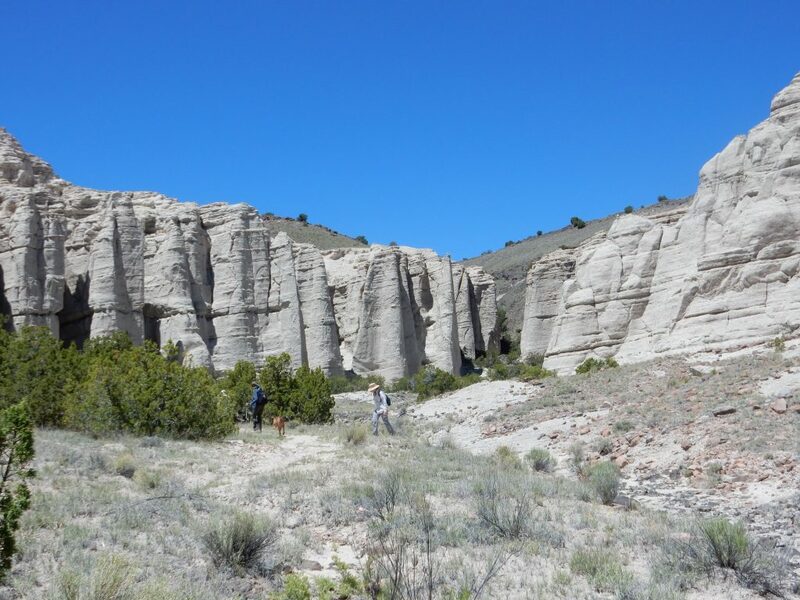 A characteristic feature of the Abiquiu Formation is the presence of clasts of Amalia Tuff. 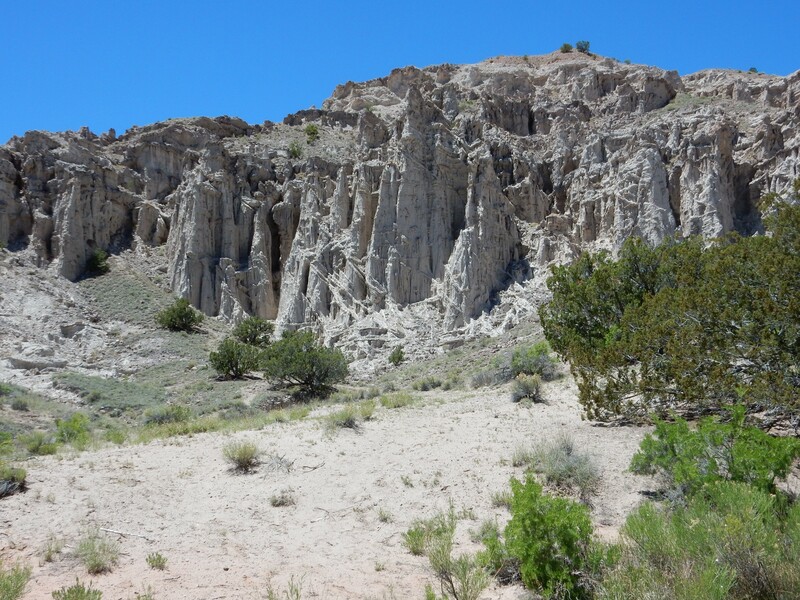 This is an ignimbrite, somewhat like the Bandelier Formation, but from a caldera eruption at the modern location of Questa that took place 25 million years ago. This eruption probably exceeded the Jemez eruptions in volume. 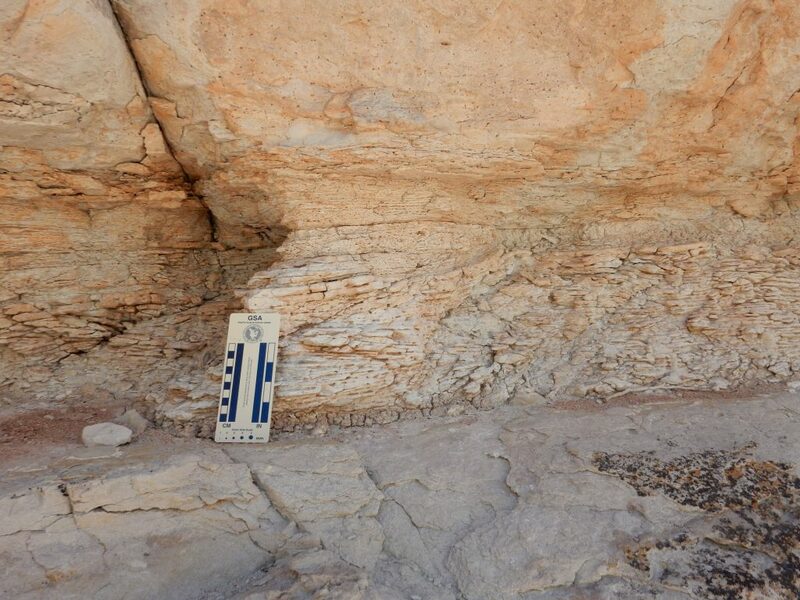 Much of the Amalia Tuff is very strongly welded, meaning that the ash forming the tuff was still very hot when it settled onto the surface, so that the individual ash fragments were still partially molten and welded together to form a very resistant rock. The Amalia Tuff is also notable for a high crystal content. The camera loves this place. Notice the reddish beds on the skyline at right. 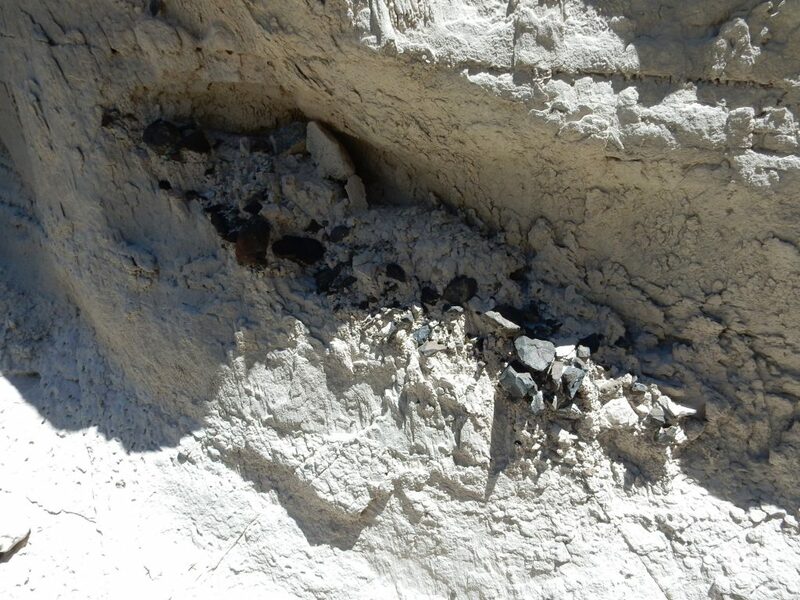 These are relatively young gravel deposits from the ancestral Rio Chama, and probably are the source for the lag gravels. Which are very impressive here. Our route came out on the main drainage in the area. Seeing the youngster here almost makes me wish I was young again. But, as someone observed on my Facebook page, I would sooner gnaw my own leg off than have to go through middle school again. Shari and Rick Kelley water their dog, Yeso, who is adept at drinking from a tube. The Yeso Group is a Permian redbed formation prominent in many areas of northern and central New Mexico. 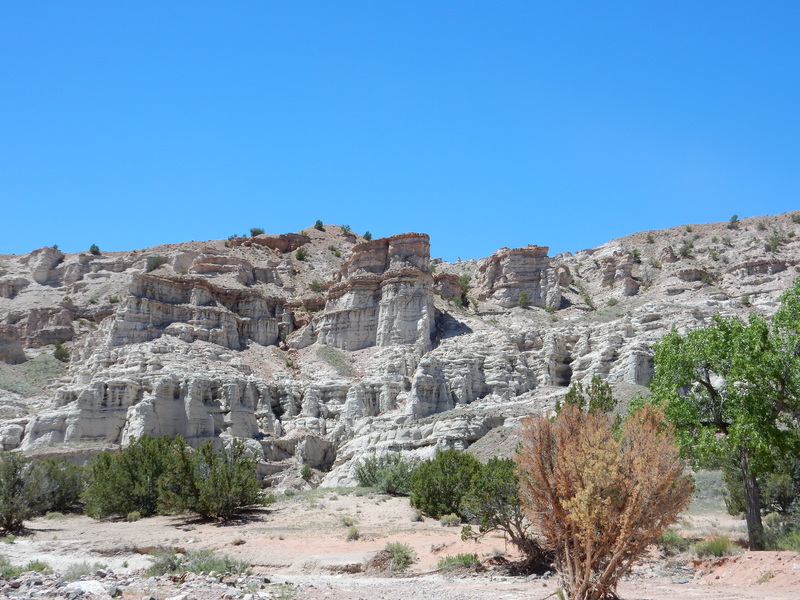 Northeast of this area was a boulder conglomerate on the canyon rim. I’m not entirely sure of the scale here, but I’d guess the conglomerate bed is at least four feet thick, and the largest boulders a couple of feet across. This was likely a rather spectacular debris flow off of the nearby ancestral Tusas Mountains. 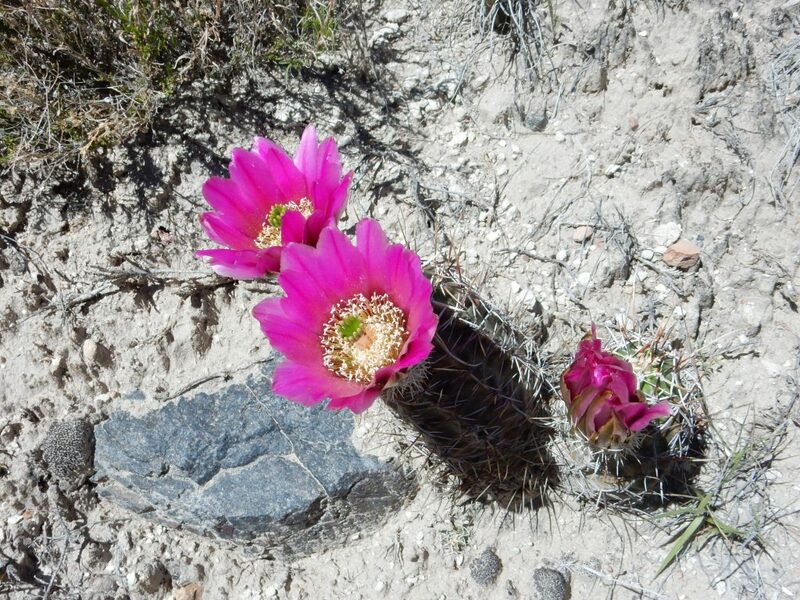 I had taken occasional pictures of flowers along the way, mostly cactus blossoms, but I still haven’t the hang of it. This is the first one that turned out. 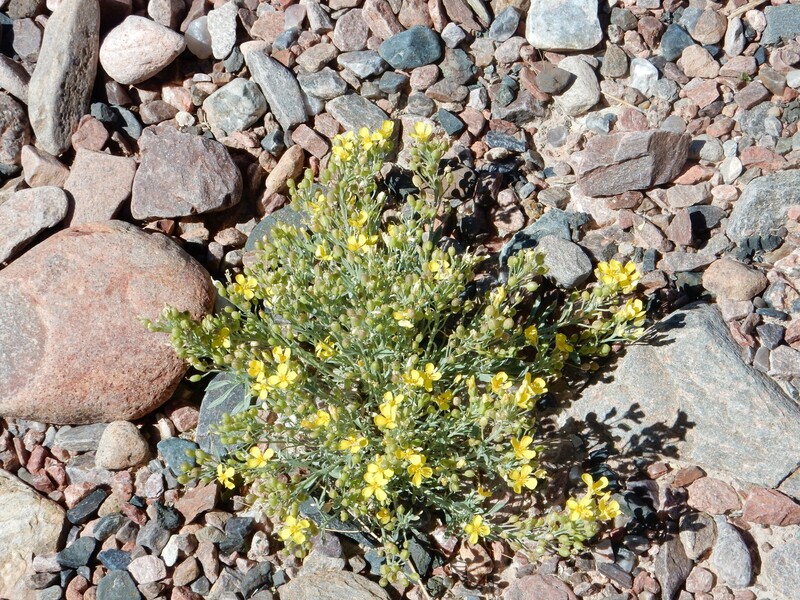 Louisiana bladderpod, Physaria ludoviciana, perhaps? But very likely something in the mustard family. We headed west to the drainage and explored some of the tributaries. There was some interesting stuff here. 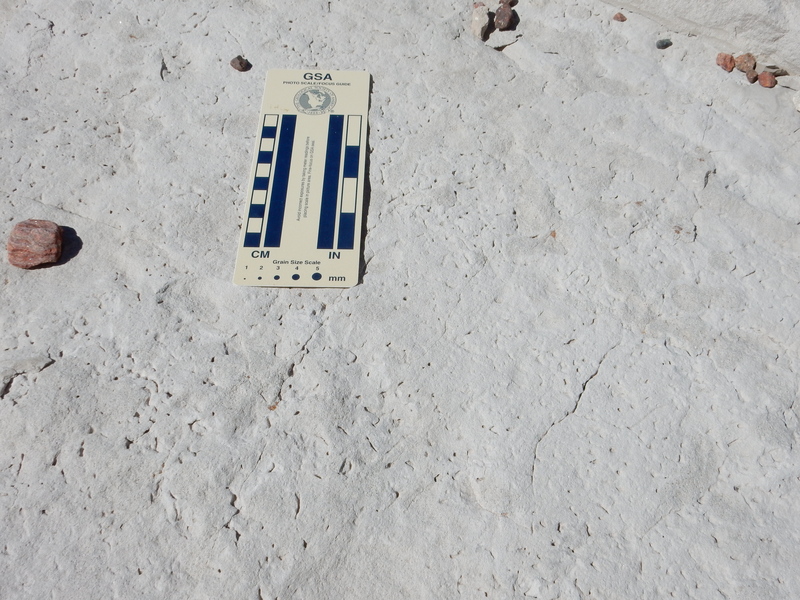 Rick Kelley identified the angular pits in this surface as crystal casts, formed when crystals of gypsum, calcite, or some other relatively soluble mineral dissolved out of the bed. Our path crossed a fault. 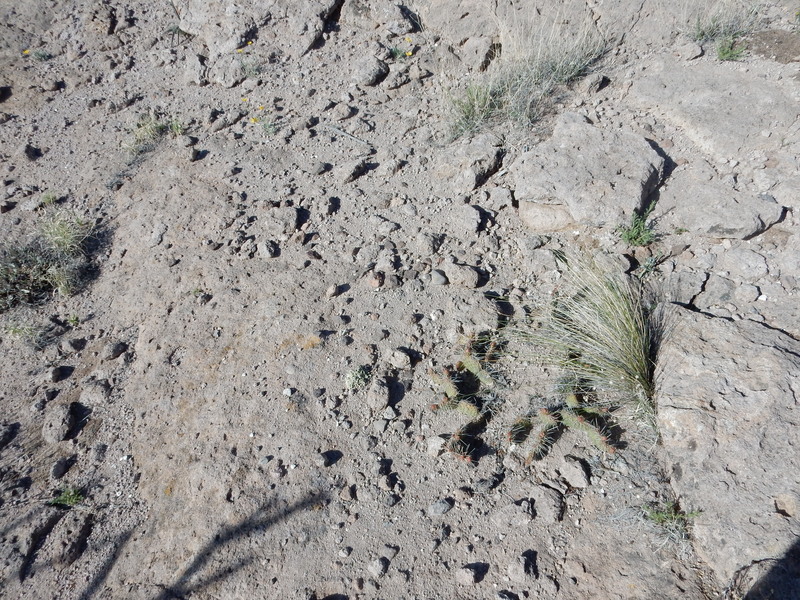 The surface to left and the notch across the arroyo mark the fault trace. This is a relatively minor fault, not appearing on the geologic map of this area. The fault trace sported manganese dendrites. Though these look superficially like plant fossils, they are inorganic in origin. Fluids rich in manganese and iron flowing along a crack naturally crystallize in this pattern. 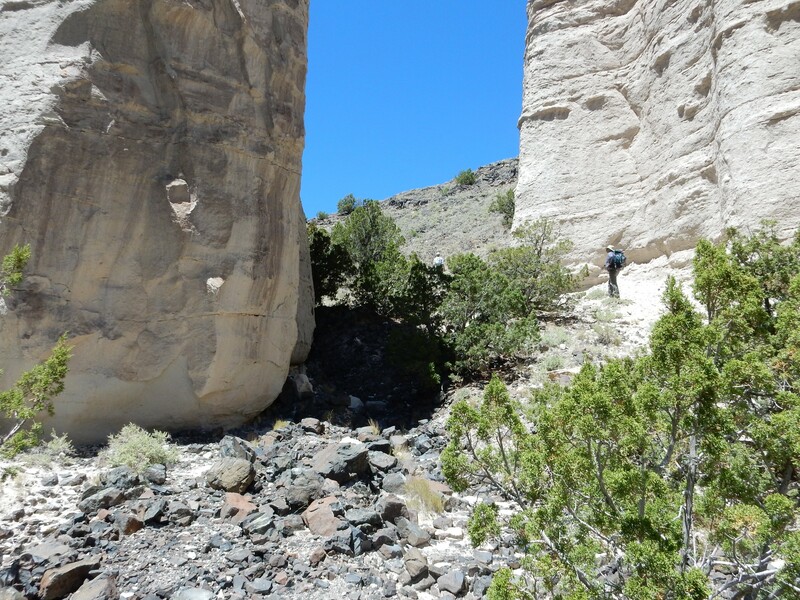 Further up the drainage, we came level with an erosional notch in the Abiquiu Formation. I’m not sure what makes these beds softer and more thinly bedded. Higher sand content, perhaps. Dacite is a volcanic rock, typical of the Latir voclanic field, that has a fairly high silica content with a relatively low alkali content. One of the others in the group handed me a dacite fragment to examine; it had crystals that looked like quartz, making it a rhyodacite. The next drainage also ended in a basin surrounded by cliffs. We turned back to the main drainage. There is enough subsurface water here to support cottonwoods. 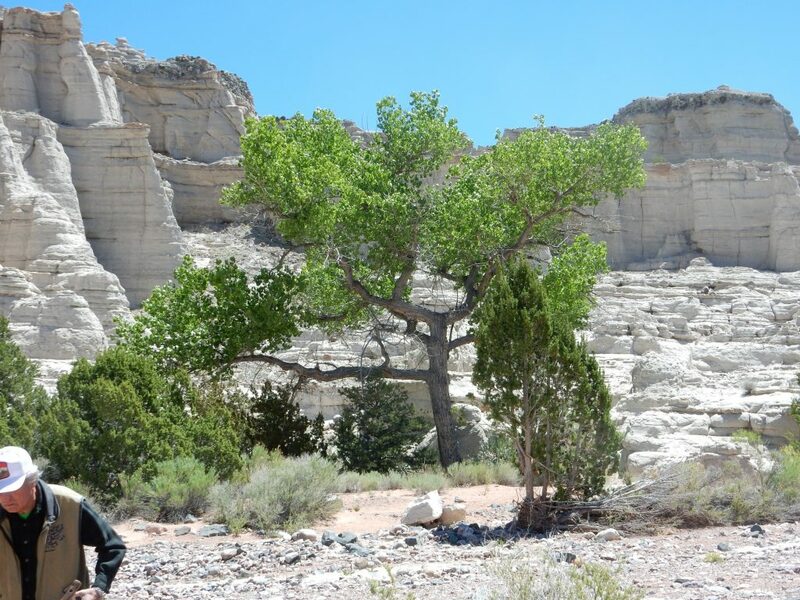 Cottonwoods require a more or less permanent supply of water in the deep subsoil. I noticed some striking beds to the south, high in the canyon walls. 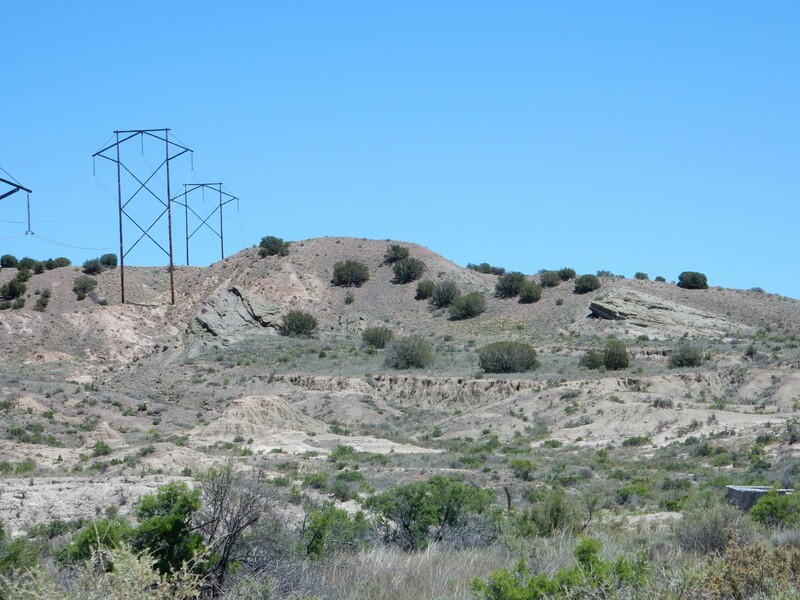 These are clearly interbedded with Abiquiu Formation, and so cannot be geologically young river gravels like those we saw earlier. Rick Kelley suggested these were “cooked” by fluids off the nearby Cerrito de la Ventana dike system, of which we’ll see more in a moment. These would then have been particularly porous beds acting as aquifers for the fluids. A gap through the canyon walls shows the dike to the west. 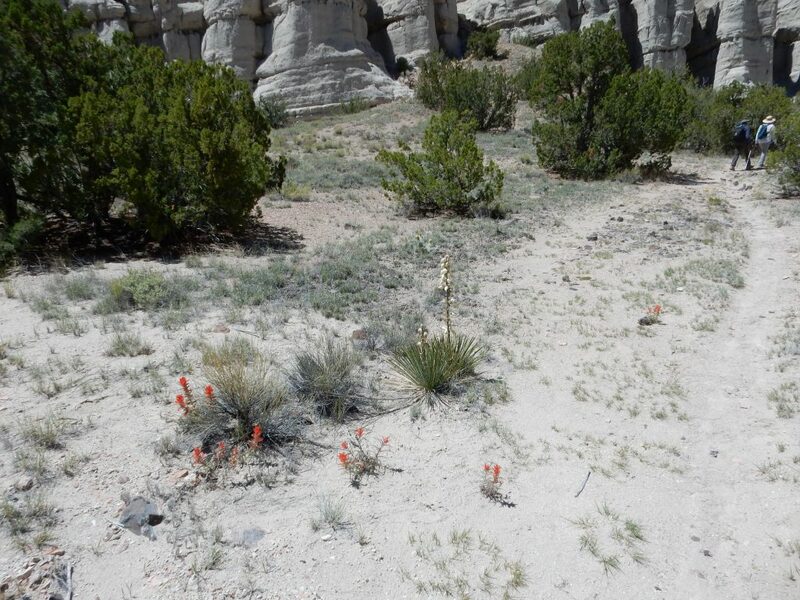 Most readers will be familiar with the red Indian paintbrush and the white yucca flower. The white daisy is familiar. Probably Melampodium jeucanthum, the blackfoot daisy. But the blue flower puzzled us. Obviously a dicot, but not a composite (simple flowers), a legume ( no “keel”), or a mustard (five, not four, petals, and blue is a rare color in that family). From the big showy individual flowers, I would guess it’s from one of the more primitive dicot families (in an evolutionary sense.) 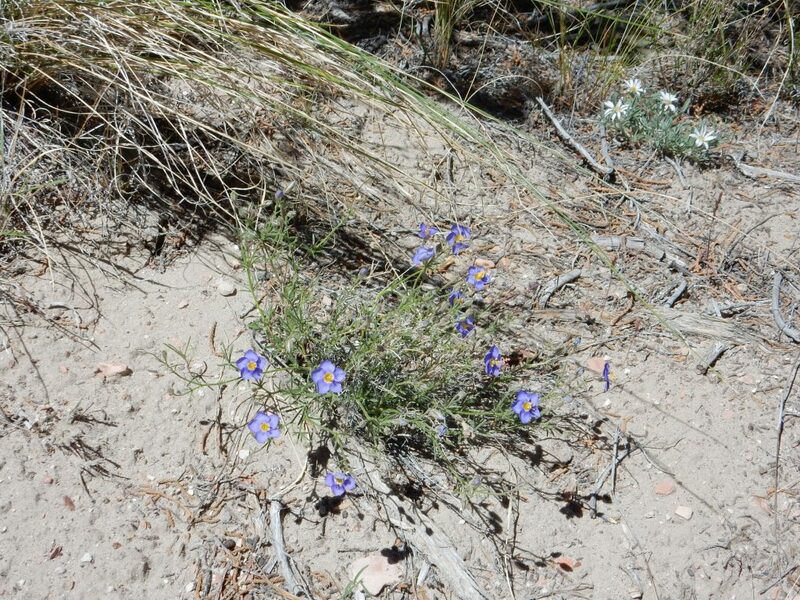 Perhaps a phlox or flax? It took some heavy Googling to find a match, but this looks like Giliastrum acerosum, the Spiny Blue Bowls. Sure enough; phlox family. We approach the narrow pass out of Plaza Blanca to the Cerritos de la Ventana dike. Notice the basalt debris eroded from the dike. Here’s some that has been reworked into the canyon wall. 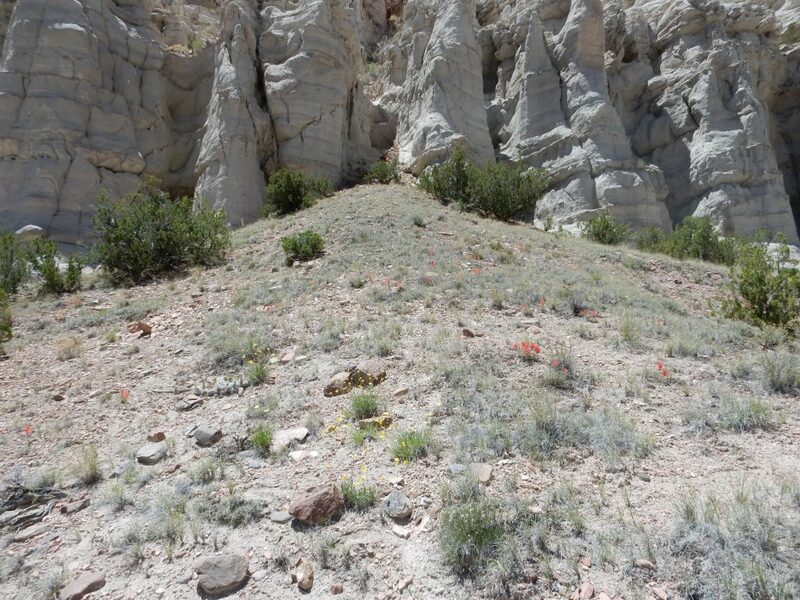 By which I mean that sediments eroded off the Abiquiu Formation and basalt eroded off the dike mingled here to leave this deposit near the base of the canyon wall. According to the report accompanying the geologic map for this area, and a couple of other recent papers, the dike has a radiometric age of about 19 million years. 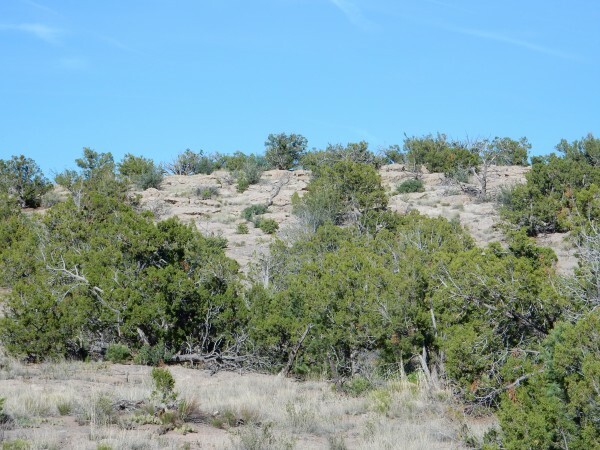 That would make it considerably older than the Jemez Mountains. You can see some baked rocks close to the dike. The dike also appears to split into two strands here, visible on Google Maps. The geologic map doesn’t show the smaller strand, but it does show two strands visible on the skyline to the south. Time to start heading back. I noticed some interesting fracturing in the canyon walls north of this spot. 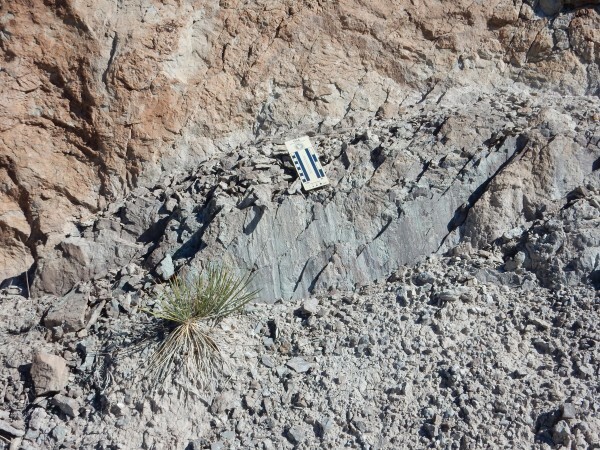 The fractures are at a distinct angle to the bedding. Rick Kelley described these to me as conjugate fractures. 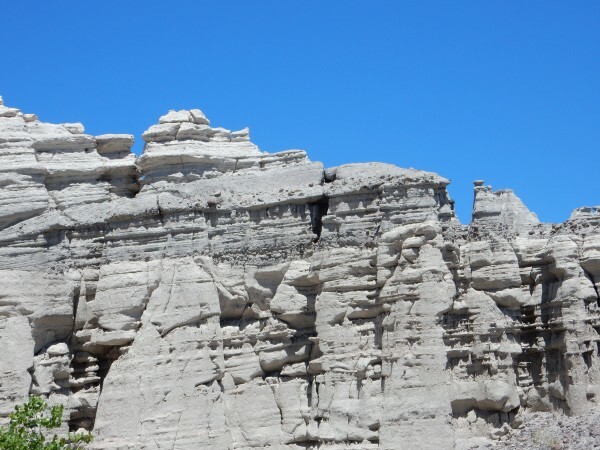 The more normal case is orthogonal fractures, where two sets of fractures in a rock formation meet are more or less right angles. Echinocereus fendleri, most likely: Fendler’s Hedgehog. Rick Kelley and Yeso in a contemplative moment. I’m not sure what kind of stress field could cause this, so looked it up after I got home. I got the impression from Google that no one else is sure, either. 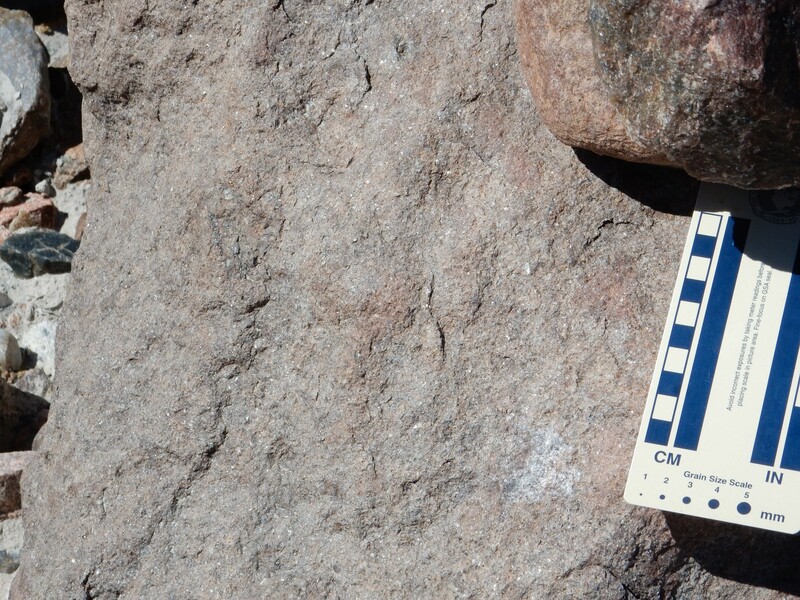 There isn’t any obvious displacement along the cracks, and neither set is aligned with the bedding of the rock. A little further down was a wild beehive in a joint in the cliffs, You could hear the buzzing from a hundred yards away. My first impression was that you were seeing right into the hive and the honeycomb. Looking at the zoomed picture, I wondered if this might be a mass of propolis, bee glue, walling up the hive. But probably not. The Font of All Human Knowage declares that bees use beeswax for larger openings, and propolis only for narrow openings. So, a wall of beeswax walling up the hive. Almost back to the parking area, and some pretty wild rock beds to the south. 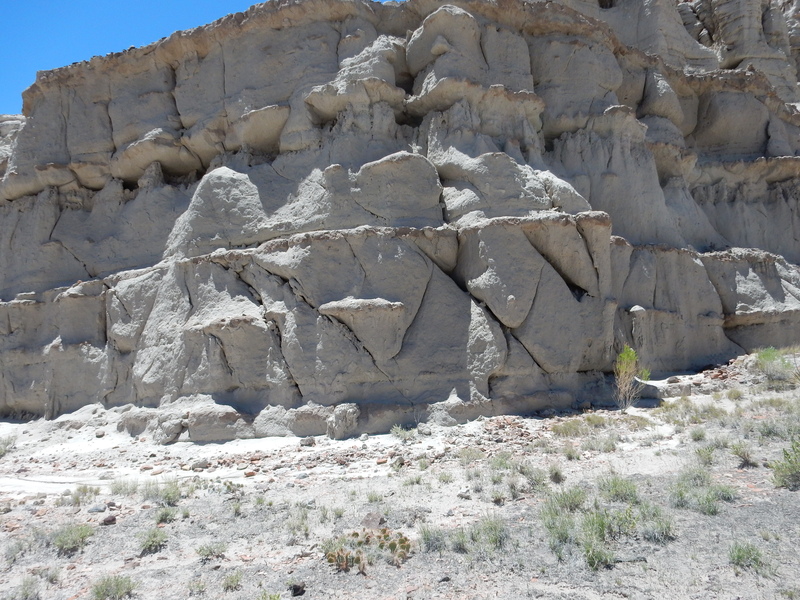 Fracturing and deformation from the nearby Plaza Colorado fault, perhaps. Video of debris flow in Clear Creek Country, Colorado. The geologic map for the area identifies these as remnants of a tuff ring in the Chama-El Rito Member of the Tesuque Formation. This tuff ring was likely the base of a maar, a kind of shallow volcano formed by steam explosions when silica-poor magma penetrates rock beds just under the surface of the ground that are saturated with water. 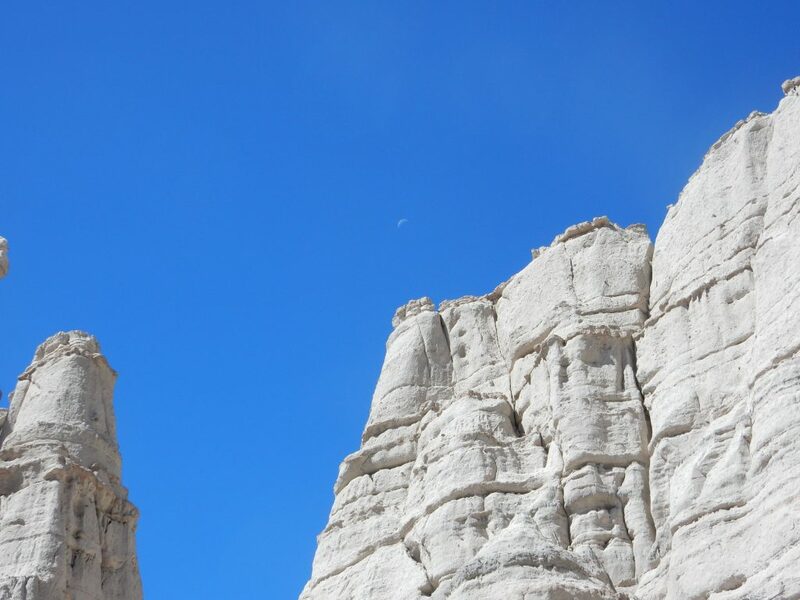 I’m fascinated with all of Plaza Blanca but there is one area that I love and don’t understand. You have a photo of it. The rock is twisted fantastically with ropey gray-white rock, as if some giant vine has petrified. Just before your photo the text says, . 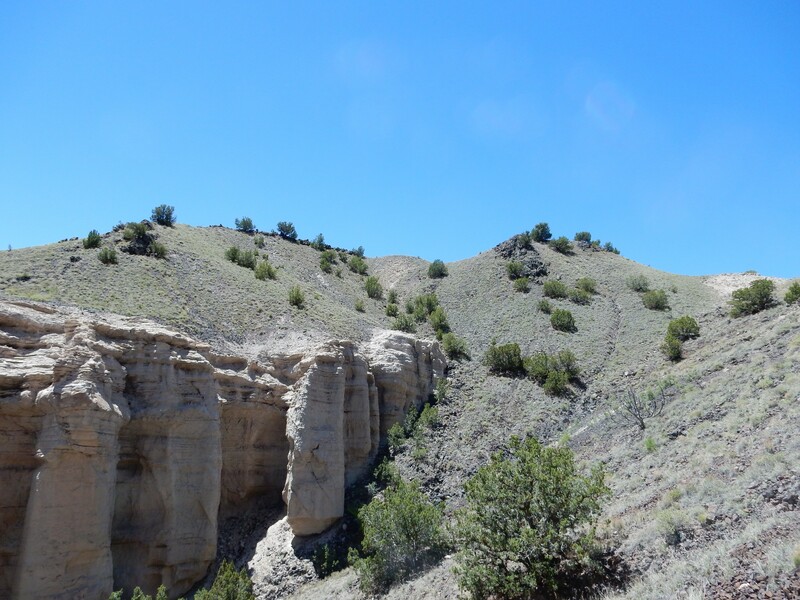 . . “wild rock beds to the south.” Just after the photo, it reads, “Fracturing and deformation from nearby7 Plaza Colorado fault, perhaps.” I would love to understand better what and how these “vines” were formed. The whole thing look as if it should be in Game of Thrones. I wrote an email to you today but I want to thank you again for your wonderful information. Sorry for the very long delay in replying. (I’ve had a little excitement starting in September; fortunately, the ankle is now healed …) I am no expert in fault deformation, but motion along a fault can certainly deform nearby rock beds in unusual ways. But it’s a guess on my part that that’s what’s going on here.